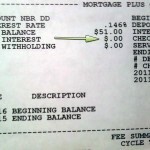 With interest being as low as it is, no interest savings accounts almost make sense. Think about it, if you have $2500 balance in your saving account and you are earning .8% on it, that’s only $20 a year. It might not even be worth the tax paperwork! 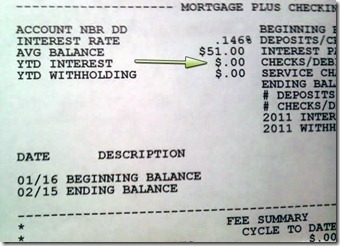 I however have a no interest savings account, but not my choice. 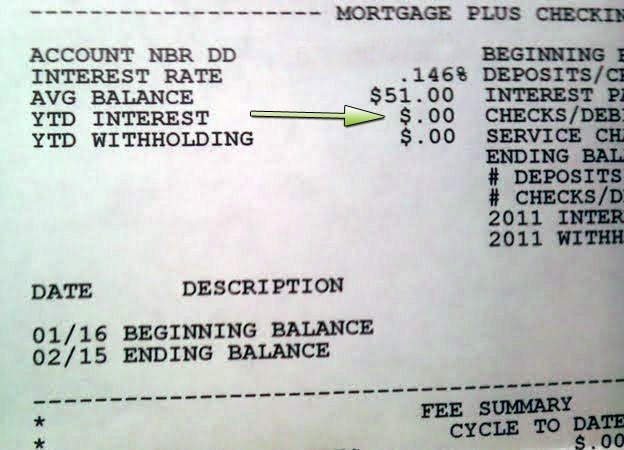 A while back when I refinanced my house I had to open an account to view my mortgage online (the one downfall of my bank). I was kind of bummed about it, but the bank teller told me “If you open an account today, you get $50 free.” So I opened an account with a dollar. My $51 savings account just received it’s first interest adjustment, which is at .146% a year or about .0122% percent monthly. My interest earned in the last month was $.006222. That is right,I didn’t even earn a single penny! This account does have checking by the way, but it was advertised to me as a dual savings/checking. I’m well aware that I could be getting about about .8 to 1% on a good online savings account, but I have no interest in taking the time to set it up, because I keep my savings and checking accounts very lean. I wonder if I can ask my bank not to mail me a paper print out and just deposit the postal into my account. Stamps are going for $.45 which would be about 10.59% a year if they would just deposited the postage money into my account (since apparently they send these monthly). I also have to believe you can factor another $.10 in paper, ink, envelope, and someone physically handling this paper. That puts us up to 12.94% APY return. Now I realize they would never actually do something as stupid as deposit the ink, paper, postage, and handling money into my account – but do you think I will earn $.01 next period since I earned $.006 that wasn’t realized this period? Do I even want to earn it? I am potentially look at about $.07 in interest for the year. I can’t believe this bank doesn’t have a policy to not issue statements for accounts under a certain amount. What a waste of resources. It is possible they are forced to send out statements by other regulation, but that’s just as sad. I would rather not earn interest on this account, keep your $.07! I don’t want to have another form to report on my taxes. Also, please stop the earth from making a sadface and save a few trees.